In 1996, Harrison Tyler achieved one of his life-long dreams. The grandson of President John Tyler bought a long-forgotten Civil War fort on the banks of the James River a few miles downstream from Richmond. Artifacts found at the site include unfired Civil War lead bullets and knapsack hardware, all probably from Union soldiers. Tyler quickly set about clearing more than 100 years of brush from the site, researching the role that Fort Pocahontas played in the conflict and undertaking an archaeological investigation of the area. What has emerged-literally and figuratively-is both a well-preserved piece of Civil War history, and, more importantly, fascinating new information about one of the most important battles fought by U.S. Colored Troops in the conflict. Supported only by a few white Union soldiers manning two cannons, some 1,100 African-American soldiers repulsed 2,500 Confederate cavalrymen led by the legendary General Fitzhugh Lee. “We know from the movie ‘Glory,’ U.S. Colored Troops proved that those who initially questioned their fighting ability were dead wrong, but most of the battles in which they fought involved the extensive use of white Federal troops. The action at Fort Pocahontas proved that the African-Americans could fight effectively without extensive support from white troops,” explained Tyler, who owns Sherwood Forest, the nearby home of President Tyler. The battle of Fort Pocahontas took place on May 24, 1864, when Confederate cavalrymen led by Robert E. Lee’s nephew attacked the earthen fort garrisoned by African-American soldiers commanded by U. S. General Edward A. Wild. The smaller Union force beat back the Confederate attacks and maintained the Union’s grip on James River navigation. To recognize the site’s importance, the Commonwealth of Virginia is erecting a historical marker which recounts the valor of the African-American troops. The plaque was unveiled yesterday on Virginia Route 5, near President Tyler’s home. Both Tylers-Harrison and his Presidential forebear-are graduates of the College of William and Mary, and Harrison’s father served as president of the institution from 1888 to 1919. (As president of the College, his father is credited with securing the institution’s financial footing. )When it came time to select an archaeologist for the project, Tyler naturally looked to the William and Mary Center for Archaeological Research and its director, Dennis Blanton. 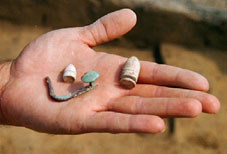 Early this year, Blanton and several William and Mary students began excavations. 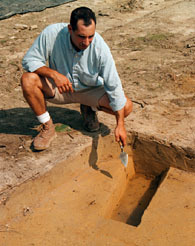 Paul Nasca, a graduate student in anthropology, excavates a trench in the earth indicative of the previous presence of a Civil War shelter. Nasca’s work is the basis for his master’s thesis. According to written accounts, the Confederates first attacked from the north and then from the east. After heavy fighting, these efforts were repulsed by the 1st and 10th Regiments of the U.S. Colored Troops and two cannons from the white 3rd New York Artillery. The Confederates experienced heavy losses, and a nearby burial ground is thought to contain a mass grave in which some of the Confederate dead are buried. Blanton went on to explain that troops often bivouacked outside the fortifications they manned. The archaeologist has also located the site of a house within the fort itself, which he believes served as General Wild’s headquarters. 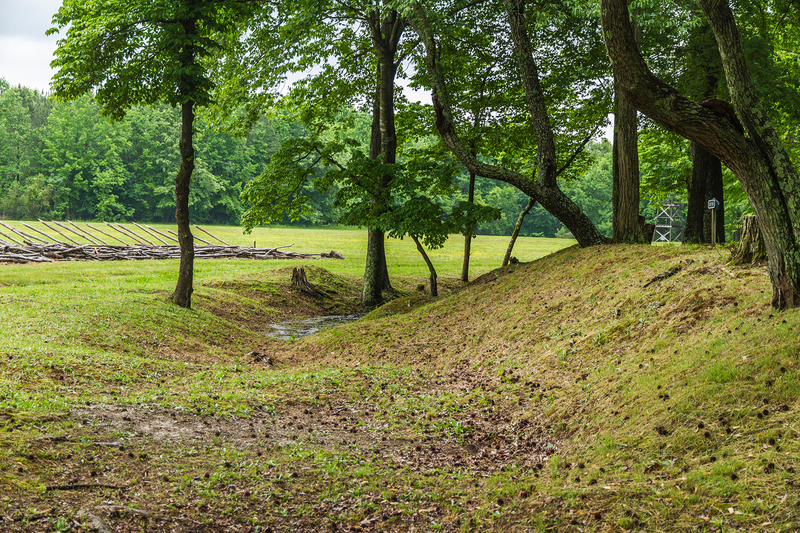 The fort’s well-preserved bastions, breastworks and gun ramps form a rectangle that runs about 1,800 feet westward from the mouth of Kennon Creek, which flows into the James near Wilson’s Landing. The fourth side of the rectangle is formed by bluffs that overlook the James River and offered a vantage point from which a few cannons could control movement on the vital waterway. Historical accounts indicate that during 1864 the fort was home to many African-American slaves in the region who left their masters to seek refuge with the Federal troops. Imprisoned at the fort during this period were Confederate sympathizers who had been apprehended by Wild’s soldiers so that they could not pass information to Lee’s embattled troops. Historians speculate the Confederate attack might have been designed to free them. As early as Colonial days, the landing (which at various times was known as Kennon’s Landing, Wilson’s Landing or Wilson’s Wharf) was used to ship tobacco from James River plantations to England. During the Revolutionary War, a thousand British troops under the command of Benedict Arnold disembarked at the landing to dash to Richmond in hopes of capturing the Virginia legislature. For almost a century-and-a- half, the fort lay forgotten (except by relic hunters), until Tyler purchased it. Once the underbrush is cleared from the site and archaeological studies are completed, Tyler hopes to open the area to the many visitors who come to tour Sherwood Forest Plantation. This story was originally published in the William & Mary News.